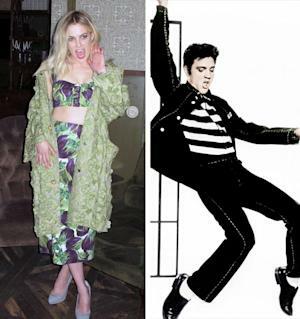 You may already know that rising starlet Riley Keough is the granddaughter of someone very very famous: the late rock 'n roll icon Elvis Presley. The daughter of Lisa Marie Presley and her first husband, musician Danny Keough, 23-year-old Riley is carefully carving out her own niche in Hollywood. With but four films under her belt, Keough appears in a small role in Steven Soderbergh's male stripper film coming out this weekend, "Magic Mike," starring Channing Tatum and Matthew McConaughey. She plays Nora, an enigmatic figure with a pet pig romantically sexually linked to another lead in the film, Alex Pettyfer, who plays former footballer and new-school male stripper, Adam. The two, who are said to have first met on the set of "Magic Mike," are romantically linked in real life and are thought to be engaged. Keough has been seen sporting a ring on her left-hand ring finger since mid-March. There is little doubt the gorgeous young blonde bears resemblance to her famous grandfather, not to mention her mother and grandmother Priscilla Presley. Indeed, "Magic Mike" director Steven Soderbergh is reported to have said that Keough "got the best from everybody in her lineage." And while she plays a bad girl in "Mike," she is said to be far from it in real life: "I'm kind of shy and quiet. But I'm only shy in my personal life. If I'm working, somehow I'm not and it goes away… I think acting is a fun thing because you get to have so many lifetimes in one lifetime, being all these different people," Keough recently told Vanity Fair. Keough has a starring role in the upcoming lesbian-themed horror-esque indie film "Jack and Diane," to be released in the fall. And there are supposed to be a lot of make-out scenes. She appeared in the 2010 movie "The Runaways," playing Dakota Fanning's sister. Kristen Stewart also starred in the film and is said to be among Keough's biggest competitors when going up for roles. Keough recently revealed to The Hollywood Reporter that she too competes for high profile roles that Stewart, Lily Collins and Jennifer Lawrence have wound up landing. Regarding the eccentric Jackson, who married her mother, Lisa Marie, in 1994, Keough says she mainly knew him as the stepdad who went swimming with her, dropped her off at school and indulged her candy fixes at Neverland from the time she was 6 till she was 11. A few years after divorcing Jackson, her mother wed Oscar-winning professional firebrand Nicolas Cage, which barely registered on the infamy scale with a teenaged Keough, long since inured to the tabloid gold mine that was her family. Look for Keough's star to rise as she has three upcoming films: the drama "Yellow," starring Sienna Miller and Ray Liotta; Kough has a starring role in "Kiss of the Damned" alongside Milo Ventimiglia; and perhaps the most high-profile project of the three is "Mad Max: Fury Road," starring Charlize Theron and Tom Hardy.